Candles are left in tribute outside Leinster House in Dublin, after thousands of people marched demanding legislation on abortion after the death of Indian woman Savita Halappanavar last year. THE HSE REPORT into Savita Halappanavar’s death comprehensively details the chronology of events, the key causal factors and linked recommendations. Three key causal factors were identified, the first identifies inadequate assessment and monitoring, and failure to devise and follow a plan, the second identifies the failure to offer the patient all management options including ending the pregnancy, and the third outlines the non-adherence to clinical guidelines relating to sepsis. In the analysis of key causal factor two, the investigators identify legislative factors affecting medical considerations. It is noted that international best medical practice, would include expediting delivery a clinical situation where there is prolonged rupture of the membranes, however it was not considered in this case for over 48 hours after the membranes had ruptured. The investigators note that the patient and her husband requested a termination of the pregnancy on October 23 (24 hours after the rupture of membranes) and were advised that this was not possible under Irish law. On the morning of October 24, the investigators comment that at this stage the treating Consultant did not think the risk to the mother had crossed the line where a termination was permissible under Irish law. There was a relative over-emphasis on the presence of a fetal heart beat and an under-emphasis on appropriate monitoring for and management of the risk of infection in the mother. In this case, the interpretation of the law in relation to lawful termination of pregnancy in Ireland and lack of clear clinical guidelines and training is considered a material causative factor in this regard. This is of great significance and recommendation 4b details a need to consider the law and any constitutional change relating to the management of inevitable miscarriage in the early second trimester of a pregnancy. The investigators recommend that administrative, legal and clinical guidelines should include good practice guidelines in relation to medical and surgical termination and that the guidance so urged may require legislative change. This was a tragic case, and all the recommendations need to be implemented to prevent such system failures occurring in the future and to protect our patients. Legally doctors have to wait until there is a ‘real and substantial risk to life’ as distinct to health. In this case, by the time there was a risk to life identified and acknowledged, it was too late. When septic shock sets in the mortality is as high as 60 per cent despite the best treatment. In this case, a miscarriage was inevitable, yet the presence of a fetal heartbeat significantly affected clinical management because as the treating consultant stated the law is not clear. The treating consultant also highlighted that there were no guidelines for inevitable miscarriage, and in this case though the patient requested active management of the inevitable miscarriage, legally it was impossible until her life was at risk. The Protection of Life during Pregnancy Bill attempts to add clarity to the law but does not change the law. It still maintains a need for a risk of life to be present before doctors can intervene. Unless the law and constitution is changed, this case could reoccur as is outlined by the investigators in Recommendation 4b. This report is damning of our current legal situation. The 8th amendment affords women no individual autonomy when pregnant; had it not been in our constitution then Mrs Halappanavar’s request for intervention on Tuesday October 23 may have been granted legally and potentially would have saved her life. The 8th Amendment ties doctors hands, and has the chilling affect of making the medical profession ‘await events’ instead of intervening; awaiting a risk to life rather than just a risk to health. When a risk to life becomes evident it can be too late as occurred in this case. 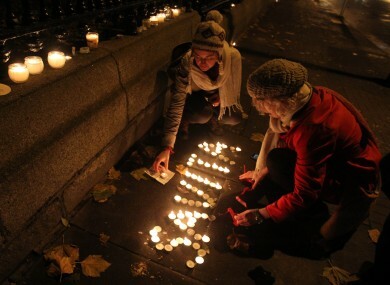 Doctors for Choice wish to extend our sympathy to the family and husband of Savita Halappanavar. We wish also to acknowledge the distress of the staff who were involved in the case. This article is written by Dr Mary Favier and Dr Ciara Flynn from Doctors for Choice. For more coverage on the abortion debate by TheJournal.ie click here. Email “Column: The new abortion law attempts to add clarity, but the Savita case could happen again”. Feedback on “Column: The new abortion law attempts to add clarity, but the Savita case could happen again”.